Olyve's Brewery is the hidden lair of Witchmother Olyve. 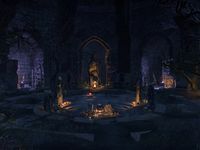 It can be found in Stonefalls, just north of Steamlake Encampment, in Auridon, south of Mehrunes' Spite, and in Glenumbra, between Crosswych Wayshrine and Par Molag. The interior can only be entered during the related quest, or by grouping with someone who's on that stage of the quest. This means that the interior is entirely inaccessible unless the event is on.